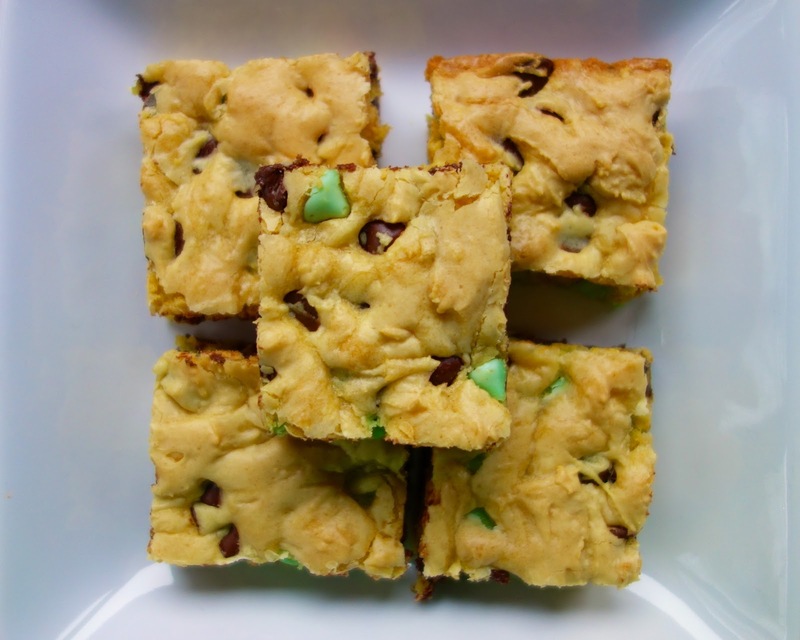 Chocolate Mint Cookie Bars - easy cake mix cookie bars. Ready to bake in minutes. Everyone LOVES this easy dessert recipe!! Only 6 ingredients! Cake mix, eggs, vanilla, butter, milk and mint chocolate chips. Whip up a batch today!! These cookie bars are SO easy and SO yummy. The secret? Cake mix. 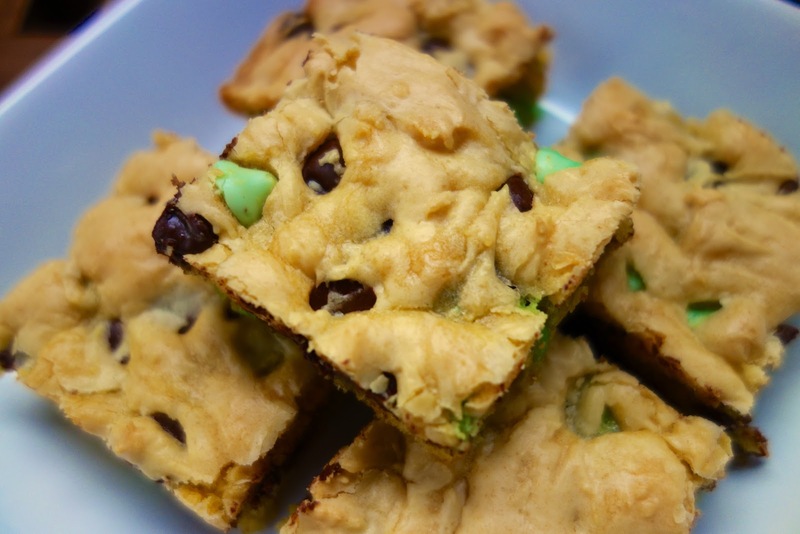 I love making quick cookies and bars from cake mix. The cookies are so moist and delicious. I decided to make cookie bars this time - even easier than scooped cookies! Just mix everything up, spread it in a 9x13-inch pan and bake. 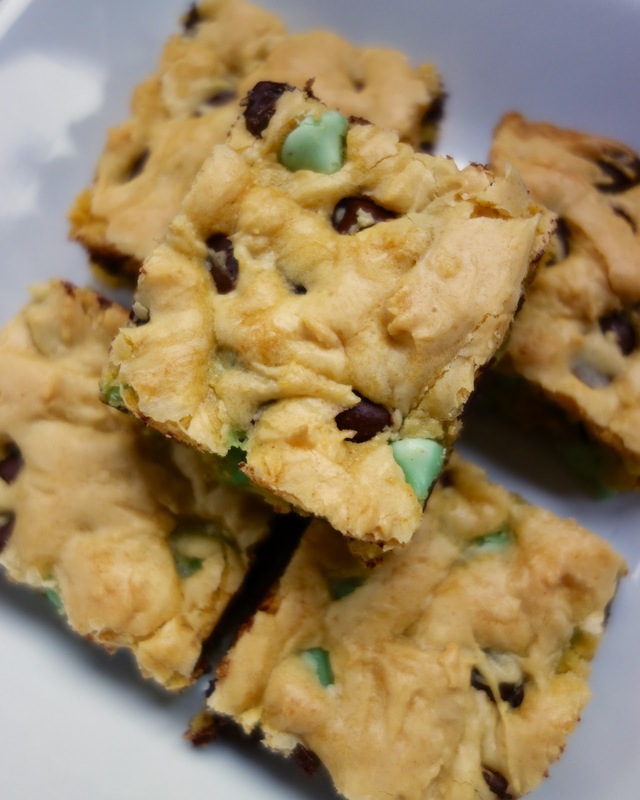 I stirred in some mint and dark chocolate chips in these cookie bars, but any type of chips will work. These are the perfect treat for St. Patrick's Day next weekend. Put them in a tin and share them with teachers, co-workers or neighbors! Or eat them all yourself. I won't judge. Preheat oven to 350ºF. Spray a 9x13-inch pan with cookie spray. Set aside. Mix together all ingredients and spread in prepared pan. Bake for 22-25 minutes, until lightly golden. Allow to cool completely and cut into bars. What size cake mix? One that makes a 9x13 cake or the smaller one? Made these this morning. OoPps, one is missing. Yep, I ate it for breakfast. It tasted wonderful. A little minty and a little chocolaty. Just right. I did use milk chocolate chips. After I baked it and cooled it a little I spread melted mint chips over the top. Pretty! Fits in a 9x13 just fine. This will be perfect to bring into work on Monday! Thank you!